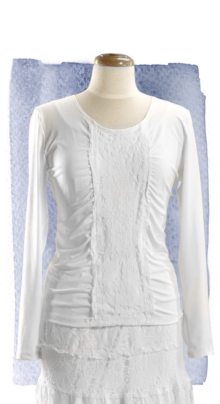 Versatile, white knit jacket with just a touch of spandex to maintain its shape, is a great piece to add to any Temple wardrobe. 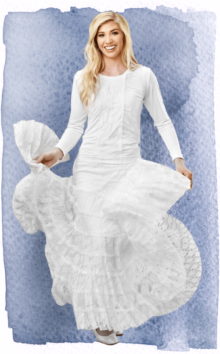 Pair it with any White Elegance knit top and skirt for a comfortable, travel friendly, three piece outfit. Style hint: This jacket looks especially wonderful with the Adagio dress. Beautiful jacket…looks good any number of other dresses, blouses and skirts. This is a beautiful jacket that won’t wrinkle. If you are familiar with Chico’s Travelers clothes, this is made of the same material. Even though it’s white, it’s not see through. I ended up returning it, though, since it hangs straight and I was looking for a jacket that curved in at the waist.